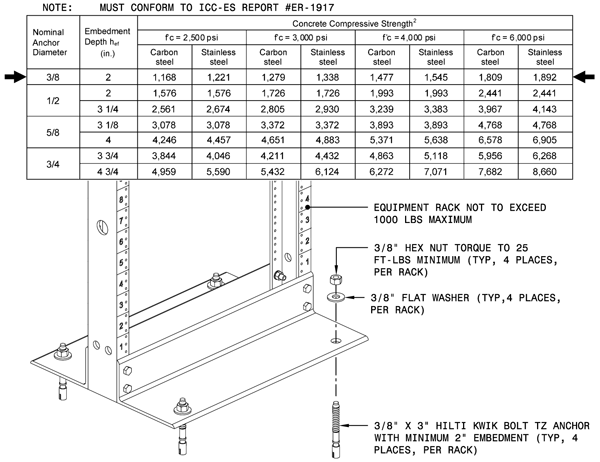 Based on each Telecom Rooms requirements, equipment rack selection is determined and all of the floor loading information is structurally calculated for equipment rack loading and seismic capabilities. 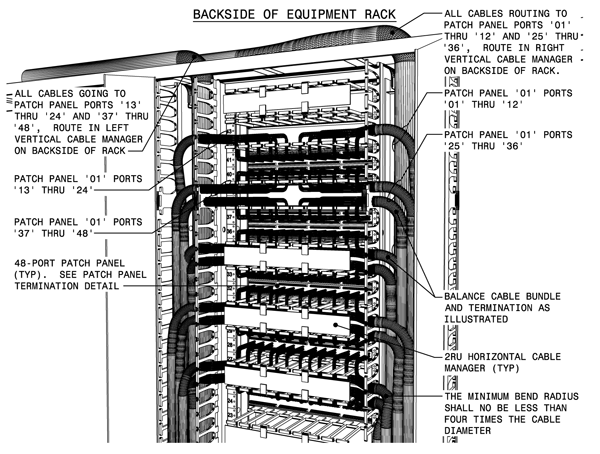 When a professionally selected equipment rack interfaces a well designed cable runway system which ultimately secures to the Telecom Room perimeter walls, it doubles for seismic stability in addition to the flexibility offered by generous, flexible, and maintainable cable routing options. 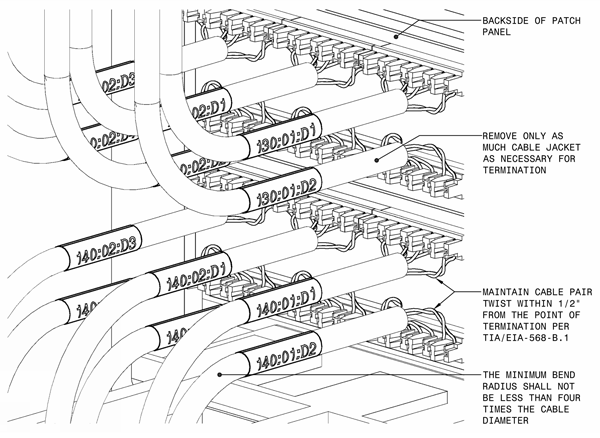 Precise cable termination practices promote a vigorous telecommunication premises cabling system that enables a structured system to provide reliable transport for the converged building systems. When the premises cabling system is well terminated, properly administered, and professionally tested, it allows your network administrator to properly manage the network down to the end points. Personal moves are easily accomplished to allow user privilege changes. Transverse and longitudinal bracing allow equipment racks to meet their loading capacities, while protecting expensive network equipment from seismic events. 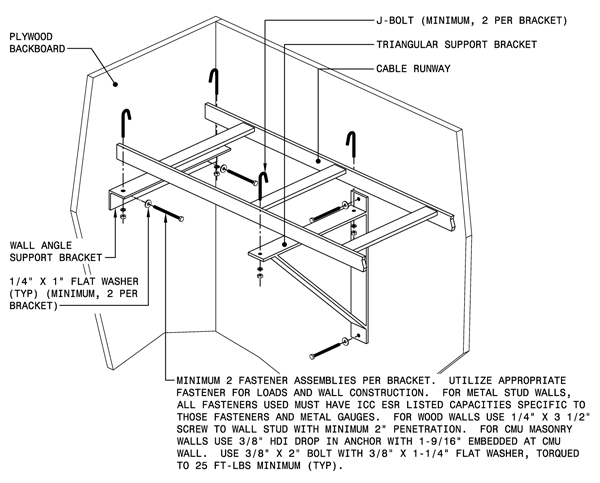 Raised floor assemblies offer several advantages over a standard slab-on-grade telecom room installation. They allow the power and cooling to reside under floor while preserving the overhead runway system for low voltage systems. The major disadvantage is a raised floor environments become unstable over time if inadequate care and improper maintenance routines are not in place. 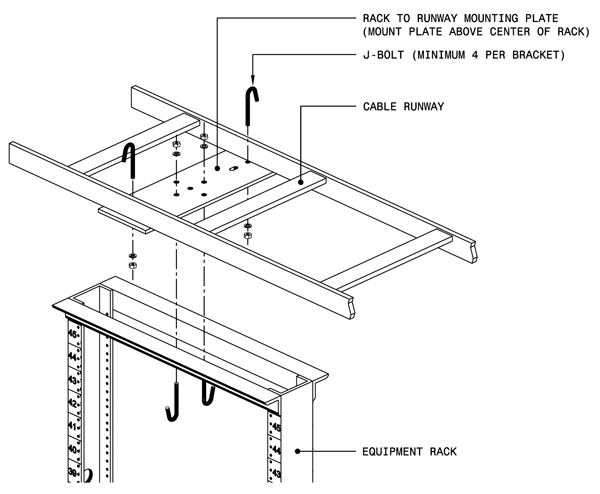 Equipment racks are structurally secured at the floor level and then reinforced attachments are added at the runway level to prevent any top-of-rack front-to-rear movement. 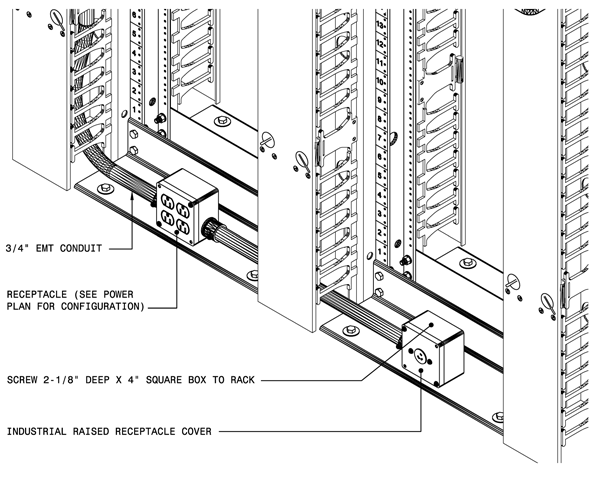 Once the premises cabling is installed and rack-to-rack patch cable interconnections are in place, these cable runways withstand a tremendous amount of weight. All of these anticipated loads are engineered into the initial design which have scaling capacities factored into the overall runway system. 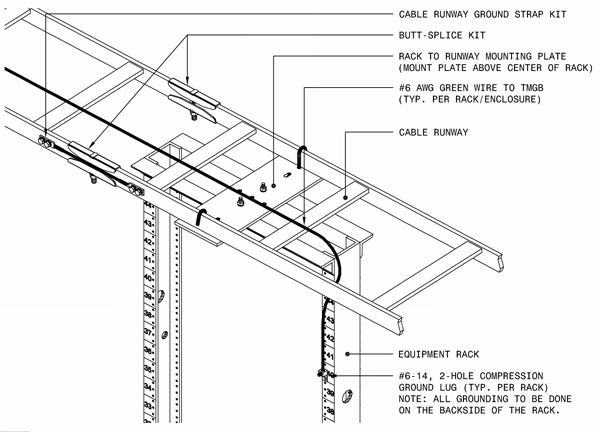 Overhead runway systems are an essential piece to a structured telecom room build-out. A well designed runway system enables a solid transport mechanism between telecom room opposing equipment racks and the telecom room plywood backboard covered walls. 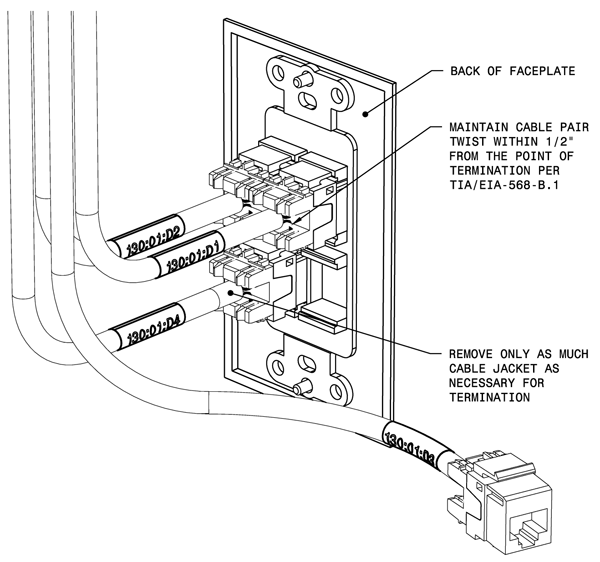 Improper mounting techniques can lead to significant last minute changes which majorly disturb a properly installed premises cabling system. Improper mounting or installing a runway upside are prime examples. Power receptacles mounted to the back sides of equipment rack bases allow easy management of UPS and PDU connections. All network equipment power cords can be easily routed down the vertical cable managers and kept away from the premises cabling installation. The conduits are routed directly to the Telecom Room electrical panels so receptacles can be easily be re-circuit or modified as the newer equipment technologies emerge. 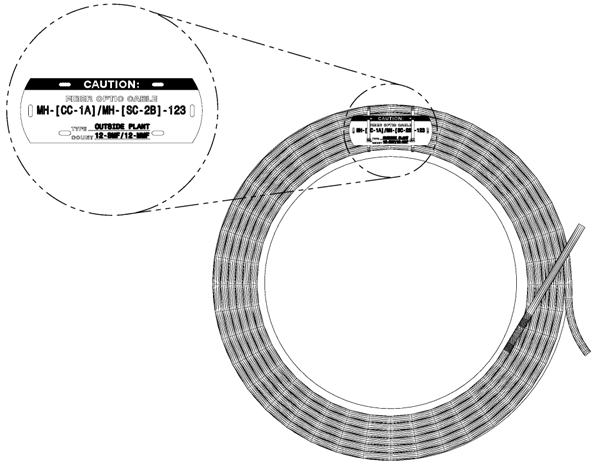 Some of the worst patch panel termination practices have produced passing cable test reports. Just one look at the back of a poorly terminated patch panel and it leaves that feeling of uncertainty throughout the whole network. When you can enforce qualitative termination measures through precision detailing, it makes the contractor accountable for poor workmanship and substandard installations. 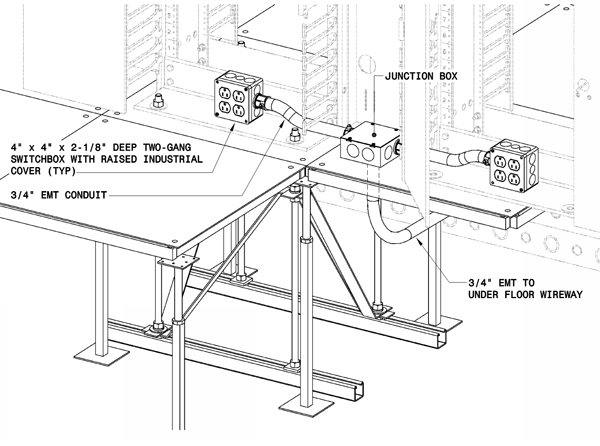 Two tier runway systems are often utilized in dense cabling environments to allow flexibility of interconnect between multiple rows of equipment racks. The top tier serves as the transport for premises cable routing and cable slack storage. 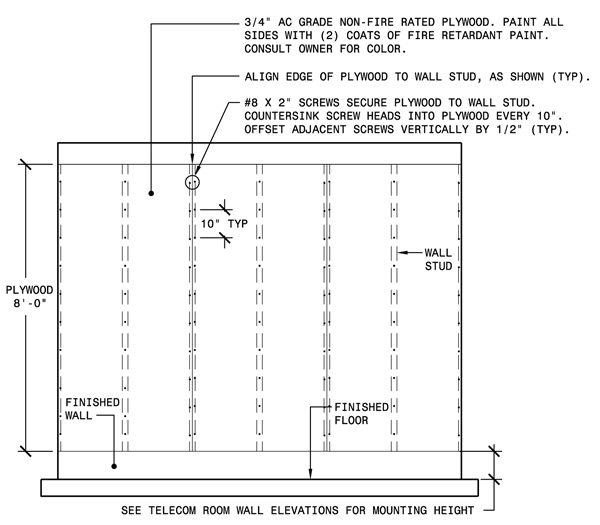 The lower tier provides the rack-to-rack and Telecom Room wall interconnections which allows easily accomplished moves, additions, or changes. From our headquarters in the Palm Bluffs area of Fresno, Ca, OneInterface provides services to our clients throughout California. Fresno is the financial, industrial, trade, and commercial capital in the Central San Joaquin Valley. This dynamic city is the hub of a region rich in heritage, resources, and people. The home for a diverse mixture of industries, businesses, agencies and institutions, Fresno offers an ideal location for successful businesses with large service radiuses like OneInterface. A well grounded system requires more than a simple ground rod. The basic principles, components, and design methods of the telecommunications grounding and bonding aid to secure your network electronic investments. 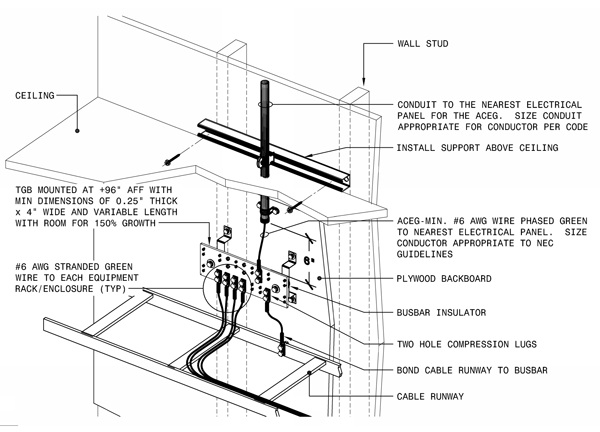 A fully compliant TIA-607-A telecommunications grounded system requires rigorous design measures to work in conjunctions with the building electrical power grounding system. Telecom Room backboards are one of the most often overlooked installations throughout the build-out procedure. Selecting the appropriate backboard types and finishes is a crucial process to delivering a quality build-out. These walls typically house active and passive equipment. Detailing installation techniques are fundamental to enable the correct installation methods and potential disasters due to poor installation methods. ...are reviewed initially with each new Client; then adapted & maintained continuously to ensure the Client and design team always maintain the same technology vision. The cabling infrastructure is not designed around any particular technology. Technologies will come and go many times over the life of the cabling system. Therefore, no technology in particular should be a design target. All cabling pathways and Telecom Rooms are designed to match the maximum capacity of the spaces they serve and have adequate accessibility. All future cabling and technologies can then be added without construction and with minimum business disruption. No matter how superior a systems capabilities are, it won’t be used if the users don’t trust it and/or the staff cannot operate and administer it effectively. All designs shall provide maximum capabilities that are supportable and sustainable from the viewpoint of the Owner. User expectations of a home telephone service are extremely high. This reliability expection is the result of pre-planning, service, and implementation rigor initially designed in by the Telco design engineers. The Telco service technicians are simply propagating the model and updating the documentation. This preplanning model clearly works and is a model every enterprise network should be based on. Every cable, copper or optical fiber, is subject to a strict suite of performance criteria that allows for calculable performance and technology support determinism. It is absolutely determinable whether any particular future technology will work or not before you purchase. A properly designed uniform structured cabling system is easier to understand, test, and maintain by your IT and maintenance staff than several disparate technologies. The design and integration of the network electronics must take place before the turn-up of converged systems requiring network transport. Networks are no longer just an overlay system and relatively insignificant. When designed and certified strictly per TIA standards, cabling systems typically carry a manufacturer’s warranty of 25 years or greater on both cabling and installation. Proprietary cabling systems are be avoided. Proprietary products are typically pre-standard versions and may never reach the performance criteria of the next ratified standard. Staying standardized means you’ll never be subject to vendor lock-in. Maintaining that your buildings use a TIA Standards based infrastructure ensures that the technology manufacturers are always designing their products to work with your installed infrastructure and not the reverse. 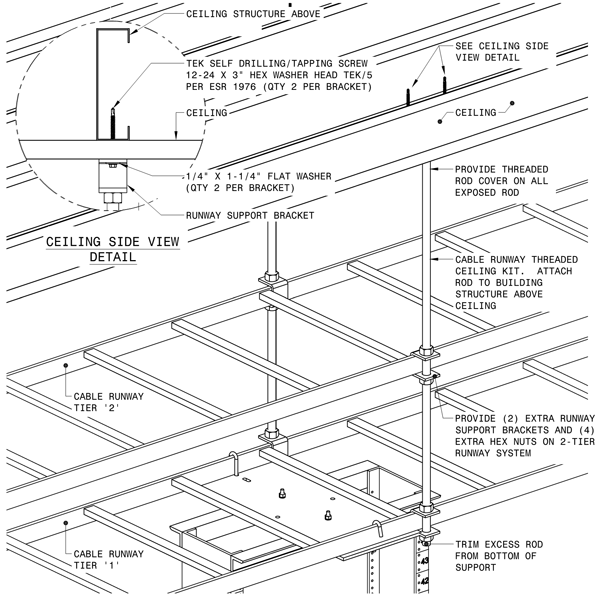 By converging building systems over a common infrastructure from the initial design, funds typically allocated for non-converged conventional systems (intra-building and inter-building parallel conduit, cabling, and termination labor) may be reallocated to build a more robust internetwork from the original construction budget. Similar to the way it’s unnecessary to know where Google is located, converged services may be hosted/sourced from any well contacted location in or beyond your network. This improves IT response and repair times by putting the equipment wherever the IT staff that maintains them reside (even if it’s outsourced). A collapsed core allows you to save money by leveraging economies of scale and more completely utilizing the head-end hardware. The savings results from the ability to allow multiple remote sites to share fewer, but more robust, head-end hardware as opposed to distributed less robust, under-utilized, hardware units at each site. By using the network as the common transport for all building systems, a single well understood management system could monitor the transport for all systems. 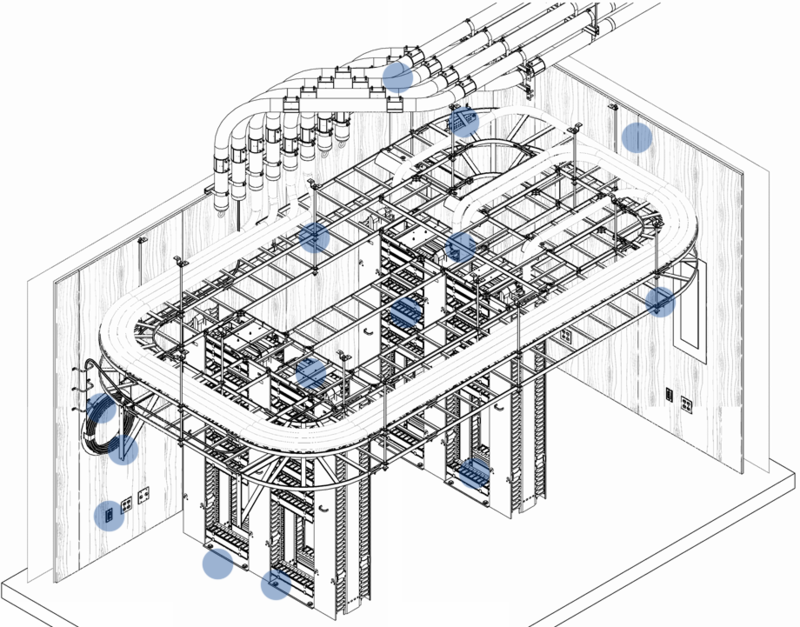 Drawings must have sufficient detail to allow you to legally, and confidently, enforce both the quantitative and qualitative design requirements. The detail should allow for “legally binding determinism” regardless of the Contractor chosen. All facets of the design and implementation shall as thorough, standards based, and self-documenting as possible to allow for easy port/device differentiation from both onsite and offsite; with docs or without. Electronics administration should be possible from anywhere with IP connectivity. The design and final documentation educates your current and future IT staff and provides an explicit and thoughtful technology baseline to continue from with future projects. The Design & documentation shall be sufficient for IT administrators to easily and explicitly delegate tasks remotely to junior staff through WYSIWYG drawings. Saving IT staff time while facilitating the maintenance of the as-built documentation which saves future design fees and construction surprises.